The common thread connecting these three recently deceased individuals stands out like a flashing neon sign for an objective observer: they were all executed without benefit of arrest, arraignment and trial. That is why I dare to link the supposed arch-fiend bin-Laden with a young black man in a St. Louis suburb and an American journalist kidnapped in an insane war zone. What I do know, as a historical fact, is that bin-Laden was a modern Frankenstein Monster, armed by the CIA and set up to wage guerrilla war against Soviet forces in Afghanistan in the 1980s. And he turned against his creator. What was the crime of Michael Brown? Was he a thug, a bully, a cigar thief? He was never arraigned, tried and convicted of any of these charges. His real offense was to be a young black man on the streets of America in the 21st century. Yes, I’ve heard it claimed that we now live in a “post-racial” society. How I wish that was true! Being young and black is the same “offense,” of course, that cost numerous members of racial minorities their lives in the 20th, the 19th, and prior centuries. Mr. Brown’s punishment was to receive six rounds from a cop’s gun–two in the head, according to reports I’ve read–and to be left to bleed to death without medical attention, according to witnesses. And in the wake of this execution–and I insist this is the proper characterization–the town of Ferguson, Missouri, which I didn’t previously know existed, was put under military occupation, replete with armored vehicles, stun grenades, riot gas, rubber bullets and lots and lots of automatic firearms. Should I stand up and salute this development as well? With the apparent execution of James Foley, Commander-in-Chief Obama has appointed himself spokesman for all humankind and the present century, declaring there is no room here for an organization like the “Islamic State.” This is the ultimate in imperial hubris, given the enormous killing machine he commands–and now freely utilizes. Untold numbers of civilians lie six feet under–when there were enough mortal remains to be recovered–in multiple nations abroad, the result of US drone strikes and more conventional armaments on this president’s watch. Does this win hearts and minds to the notion that America is a shining city on a hill, an example for the world to emulate? Or could it be breeding more fanatical enemies, with repercussions someday right here on US soil? Let’s say, for argument’s sake, that the “Islamic State” is 50% as foul as propaganda is depicting them. That’s still pretty bad, and I have zero sympathy for anyone who wantonly kills in the name of religion or out of ethnic animosity. My sympathy goes to journalist James Foley and his loved ones. But my sympathy certainly also goes to the recent, and ongoing, victims in the Gaza Strip, bombed to pieces by Israel, militarily and diplomatically supported with my tax dollars. This festering sore–we fast approach the 50th anniversary of Israel’s seizure of Egyptian, Syrian and Jordanian territory during the Six Day War, which they hold on to in defiance of UN resolutions–ensures ongoing violence in the Middle East indefinitely. That folksy fellow who lives at 1600 Pennsylvania Avenue–you know, the recipient of the Nobel Peace Prize–could ease these tensions in an instant by withdrawing carte blanche support of Israel. 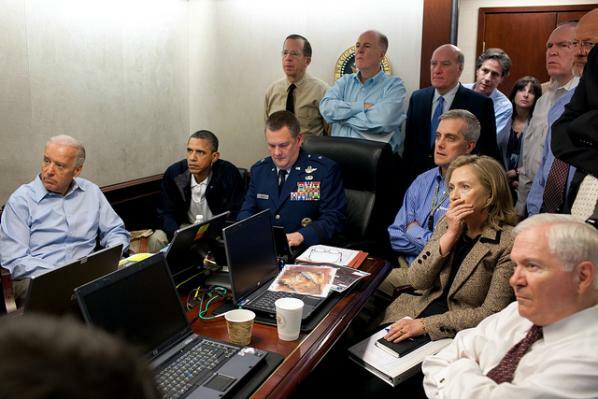 He sat there in the White House Situation Room with his assembled Cabinet and watched the live video feed of the extra-judicial execution of Mr. bin-Laden. Very brave, Mr. Commander-in-Chief! But you seem to lack the backbone to take any action that might actually lead toward peace in the Middle East. Mark Twain skewered the hypocrisy of the United States–and of “Christendom” as a whole–when the U.S. seized the Philippines during the Spanish-American War and slaughtered Filipinos fighting for independence. He suggested that U.S. missionaries in China and other foreign lands be recalled and put to work trying to civilize conditions here on the home front. If I thought it would do any good, I would now call for U.S. missionaries to return and try to effect some changes in Ferguson, MO. And the White House as well. Like Twain, I detest hypocrisy. My heart cannot swell with pride to see my own country operating as the leading hypocrite in the world today. Greg Laxer is a lifelong peace activist who served time in military prisons for opposing the War against Viet Nam from within the Army. But no American journalist apparently has the temerity to ask such questions of the Nobel Peace Prize winner who sits in the White House and regularly condemns unknown persons to death without charge or trial anywhere on earth that he pleases. And I know for a certainty that no American president will ever acknowledge the violent reprisals that increasingly endanger Americans living, studying, working, and travelling abroad as a result of America’s hyper-militarized foreign policy — now increasingly evident in the streets of America’s own towns and cities. A provocative, enlightening, and refreshing essay on current events! I would have never linked these three deaths, but it certainly makes sense from an ethical perspective. That, no doubt, is what America has lost in recent years – its principled sense of ethics. Before, we would break those rules with at least some consternation. Now, the rules are arbitrary rewritten to give pretense to our amoral pragmatism.